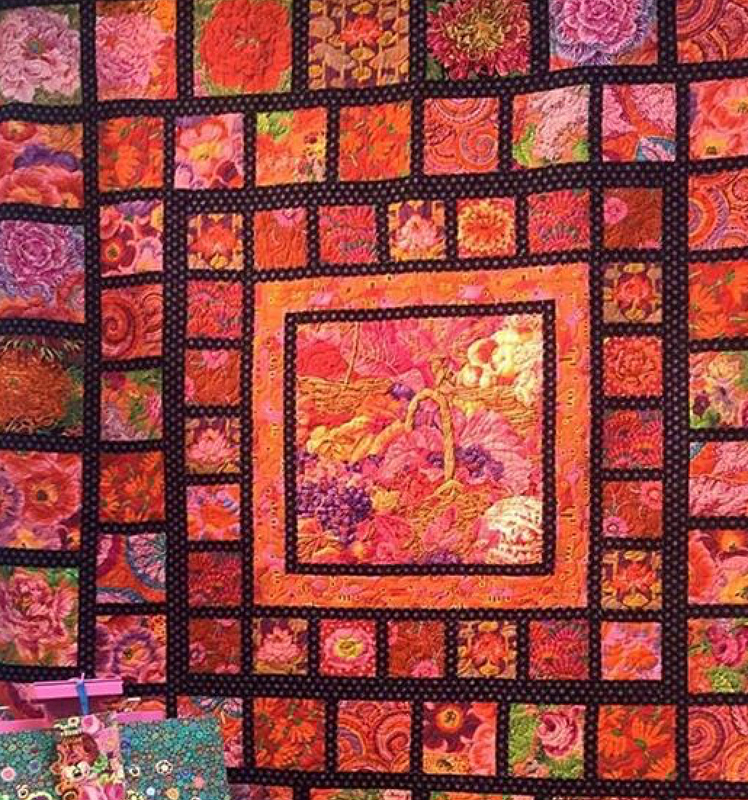 Last weekend I had the great pleasure of attending a Kaffe Fassett class in Wellington. I've been a big fan of Kaffe Fassett fabrics for quite some time now. I just love the rich colours in his collections. The class was a great experience and I would highly recommend attending any of his classes if you get the opportunity. I was fortunate to have my good friend Sue along for the ride. Sue and I met about five years ago at Nancy's Stitch Studio, where we both attended embroidery classes. Three years ago Sue moved to Dunedin so I don't get to see her so much now, though we do keep in touch via email. We started the weekend by going to Kaffe Colour Lecture on Friday night at Expressions Gallery in Upper Hutt (organised by Thimbles and Threads). It was a very interesting and entertaining lecture where Kaffe talked about his love of colour, his career, and how he designs new fabrics - with a paintbrush, NOT on a computer. On Saturday morning we left home at 8am for the full day workshop organised by Busy Bee Quilt Shop of Wellington. We both had a great time because we went with open minds, and were willing to try anything Kaffe or Brandon suggested. We didn't cut any fabrics before we went, and were pleased that we hadn't. Kaffe started by explaining what we should aim to achieve with the pattern, and we all went off to cut large hexagons for an hour. Brandon thought this beautiful piece of fabric would make a good dress for me. He even took a photo and put it on facebook. About 11am we moved onto the star points. We all trialed many fabric options until we found the perfect fabrics to complement our beautiful hexagons. I kept hearing Kaffe and Brandon say "you won't know til you try it - cut some and put them up". After a while I removed the star points just below the zig zag block on the left. They were too "flat" when viewed from a distance. Then I removed the star points at the top right - they were "too black". I'm beginning to sound like Goldilocks, but Kaffe and Brandon really make you study every fabric once it's in place.. Close enough is not good enough, but I now see why their quilts work so well - they put a lot of thought into the placement of every single piece of fabric. I'm fine with that approach because I hate being rushed and having to make fabric decisions under pressure. I like to stand back and be really sure before I move on. As a result, I got less up on my design wall than some other people, but I love what I have done, and feel confident I've absorbed their messages and can finish building the quilt at home by myself. The rest of the day was spent filling in our design walls as much as possible, and even thinking about possible borders. Brandon thought the teal blue would make a good skinny border for my quilt, but I'm not 100% convinced yet. However, because the suggestion came from Brandon Malby, I'll continue to mull over it. Then Kaffe went around the room and made comments about every quilt. He even gave some tips for possible future steps - what to accentuate, and what to be wary of. It would have been easy for me to work in the blues, greens and purples in the book (because they are my favourite colours), but I wanted to push my own boundaries and try something new. I'm so pleased I did, because with Brandon and Kaffe's help I've started a great quilt. It will be totally different to any others I've made to date. I thought I would do orange blooms with the black / purple spot for star points. However, once Kaffe explained how to make the most of the pattern, I knew the black / purple spot would be too dark. Fortunately I had some greys with me, and I've ended up using them for the star points. Kaffe described them as "mens' suiting" greys which seemed a very appropriate description. This was the first time I'd used a design wall, but the day after the course my kind husband went to Bunnings and bought a wooden rail and cup hooks so I could hang my design wall in the hall way. It's perfect because I will just put it up when I need it, but I can stand a long way back and ponder my choices. Kaffe spent a large amount of time just sitting on a chair, studying the quilts on the design walls, so I'm going to do that too in future. If Kaffe and Brandon come to New Zealand again I'd be sure to do another course with them. It's not so much about the pattern chosen for the class, but about everything else you pick up from them during the day. I feel privileged to have had the opportunity to attend. Did you get to share your Passacaglia? The class sounds fascinating! It sounds like you had a great day. I am tempted to do a class with them now if they ever head this way. Colour confidence is where I need help. Enjoy sitting in your chair and staring at the wall. I have a similar arrangement - a curtain rail and a large piece of quilt wadding with a sleeve I roughly sewed on one edge. If I ever retire the design wall, I can use the wadding to make a quilt! Looks like a fabulous class, and yes they are very different colours for you to use. I love their fabrics and how they are not afraid of colour. That fabric you are draped in looks good on you too. Have a fabulous long weekend. I have been waiting for your post about the Kaffe Fassett class and I have enjoyed reading it and gazing at those luscious colours and fabrics. He is coming to Cushla's Quilt Shop in Mapua - very near our NZ house - and I was very tempted to go. However, we have a short time here in NZ, and we are expecting lots of visitors so I really didn't think I could fit it in. I know Kaffe and Brandon would be marvellous to spend a day with and that a lot could be learned, especially about colour and being bold with fabric choices. So, thank you for your great photos and blog post. What a treat being able to attend the class Wendy. That beautiful orange fabric they draped you would absolutely look stunning in a dress for you, beautiful. I love all of the quilts progressions and things to look at that you were discussing. Its all so interesting. I do love Kaffee Fassett fabrics, the colours just draw you to them. Looks like a great class Wendy! I, too, enjoyed reading about all the things you learnt about colour & careful fabric placement, and watching how you processed that into your own quilt. what a wonderful day you had and evening the previous day. Kaffe is so good at sharing his skills an amazing man, have not heard his talks but had a fiend that worked with him for years back in the late 80`s and she became a designer in her own right through him ( Gill Gordon). Very envious of all those fabrics you have there, have 2 half metres of his that I take out and look at! Thank you for sarong that special they and all the beautiful pictures. I even learned things through your post. I attended a Kaffe lecture in Palmerstone North back in his knitting days and one comment he made has always stuck with me - If you get stuck add more colour. Did you get to show him your Passacaglia quilt? Several years ago I took a class with them and attended their lecture. I agree how inspirational they are. Love your direction you are going, we used shares with small squares on point to make octagons. It is interesting how the accent prints can change the whole look. When you posted on Instagram I found that flat grey bothersome, glad you swapped it out. Love your grey design wall, who makes it, I have a similar one but in white. I'd be lost without my design wall - when you get used to it it seems amazing to be without it! I really love the teal and can see what you mean about the colour choices - really like where you are going with it! What a great day you all had Wendy. Even though I really like everyone's displays I think yours to me is the most striking. I bet you are very pleased you broke out of your favourite colour scheme and went for the reds! Oh, Wendy, I am so happy for you. What a wonderful experience and you learned so much! You were right to choose the red fabrics. Learning about the qualities of the greys was a real step forward for you. It was the process that taught you so much, wasn't it? I'm so happy that you have the design wall now. Your quilting will just keep on growing! Such a wonderful post, and your quilt just knocks my socks off. Really amazing colors! (and yes--love that "dress"!) I loved all that you wrote, describing your class, and when you showed one of the final photos, I thought how much I loved the star points in the center quilt and it turned out to be your friend's. Thank you for this write-up; you are a lucky quilter to be able to take his class! I love the teal fabric for the thin border, I think Brandon is right :) A design wall is such a useful tool, if I can't decide on something, I will it up on the wall and then all of a sudden I can see what needs to be changed. Grey is a great colour to work with, it calms things down and balances out fabrics with lots of detail. The inner border fabric Brandon chose will really work too!! It's great to get sound advice from the experts regardless of how many years or experienced a quilter you are. What a treasured day you would have had, great memories and tips. I just love the hexagon quilts and would like to make one. The colours are to die for. What is the size of the hexagons? Can you buy the triangles and hexagon rulers to match? I love all the hexagon quilts and was wondering is there a book and/or pattern of sizes of hexagons and triangles so I could attempt one of these? Thank you. Hi Sandra - you're a "no reply blogger" so I can't email you sorry. 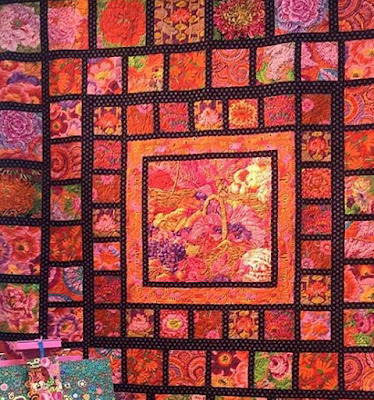 this quilt is from Quilts in Morocco by Kaffe Fassett. You might be able to get it at a library. It includes drawings of the shapes. If you can't get the book, any 60 degree triangle with a base that matches one side of a hexagon would do the trick. PaperPieces.com have sets of acrylic templates available - just email them and ask. They are very helpful. Deve ter sido muito prazeiroso seu tempo!!! Hello EJT Flynn. I'd love to see your finished quilt. Yes, please do send me a photo. I'm sorry I can't reply to you by email because you're a "no reply blogger", but I hope you see this message here. Thank you.